Pelargoniums x hortorum (Common Geranium, Zonal Geranium, Bedding Geranium, or Geranium) are bushy perennials, very popular in containers, hanging baskets and garden landscapes due to their showy single, or double flowers with red, dark red, salmon, violet, white, lavender, pink, rose, magenta or multi-color petals. The botanical name is Pelargonium x hortorum but they are mostly known as zonal geranium or pelargonium zonale. There are many varieties available on the market and every year is bringing even more and more choices. The leaves have zones of creamy, maroon, dark red or yellowish-green with various shape of zoning's. They are vigorous plants which make large flower heads exceeding pollen from spring to frost and are very attractive to bees and hummingbirds. 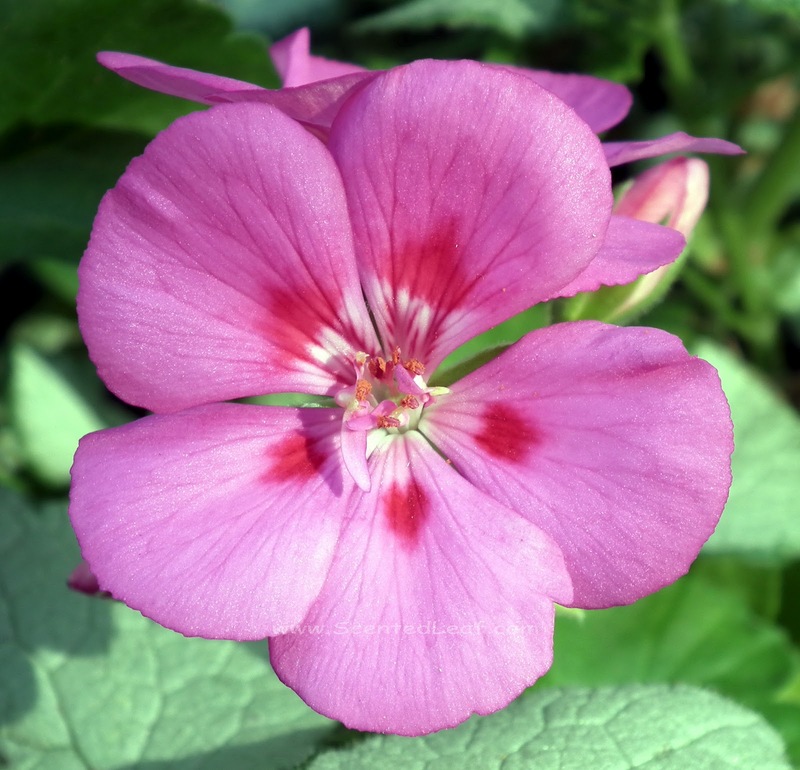 We've started from seeds many varieties of pelargonium x hortorum like: "Moulin Rouge", "Maverick Pink", "Maverick Violet", "Maverick Rose", Frank Headley, "Simply Red" and "Red Star", although they are also easy to propagate from cuttings (the traditional method). 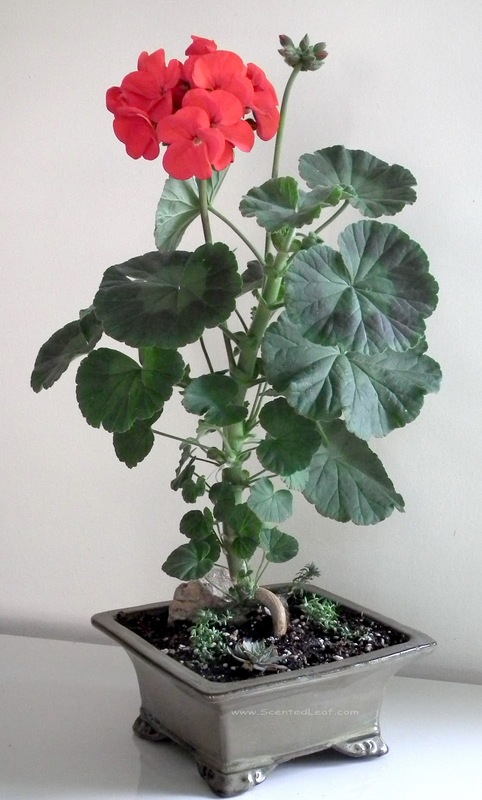 Growing Pelargonium "Moulin Rouge" from seeds was also our 2012 Raising Pelargoniums from seeds project as members of Canadian Geranium & Pelargonium Society. Pelargonium x hortorum "Moulin Rouge" "2012 CG&PS project - raising pelargonium from seeds "
Scarifying the seed before planting helped aid germination (to 1-2 weeks to germinate and sprout). 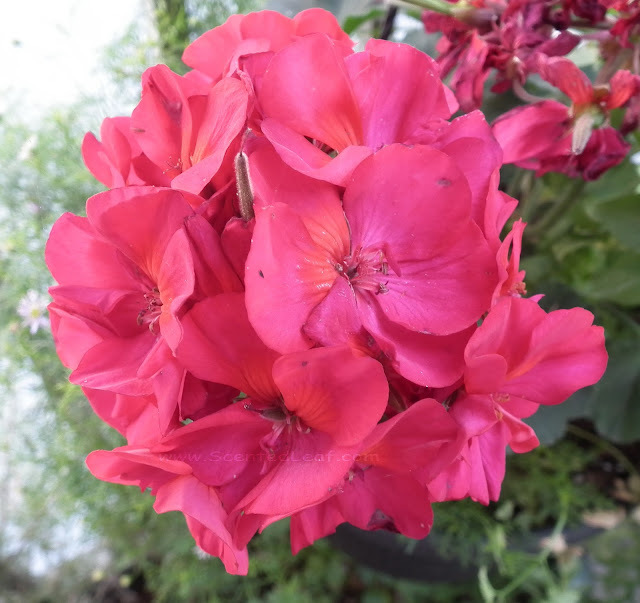 As we said many times, growing pelargoniums from seeds is sometimes challenging and time consuming, but very rewarding; plants grown from seed are generally more vigorous than cuttings. Removing the entire flower stalk after the flower fades and gathering the seeds encourage more blooms, and, believe me, they are prolific bloomers almost year round. 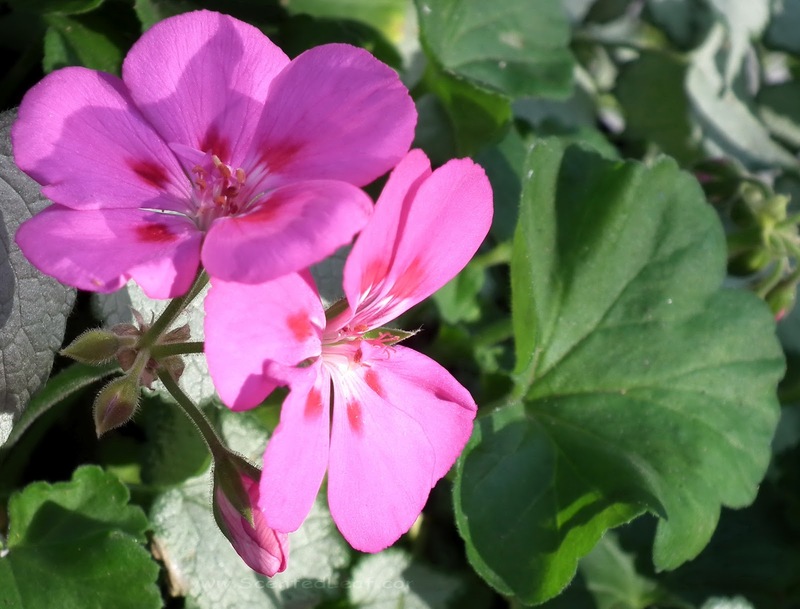 Pelargonium x hortorum are easy to raise, disease and over-watering resistant and withstand a wider temperature range than scented leaf pelargoniums. In Vancouver's climate, they may over-winter outside if the winter is mild (we succeeded last winter with some plants potted in jardinieres and hanging baskets), although it is better to provide them some protection against winds and excessive rain (especially to those plants potted in shallow bonsai pots). 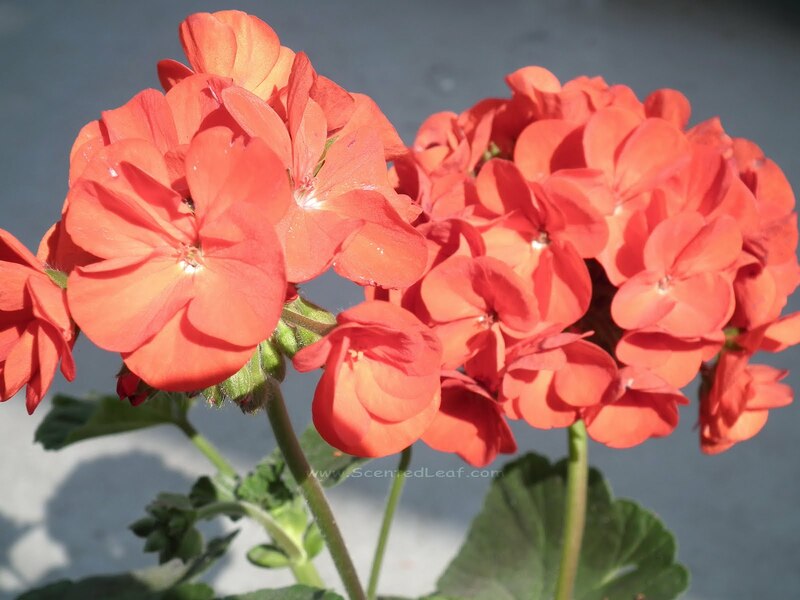 On top of their hardiness and easy to care, Pelargonium zonale (zonal geranium) are a vivid colored completion to our scented garden, and make appealing displays and eye-catching flower arrangements. 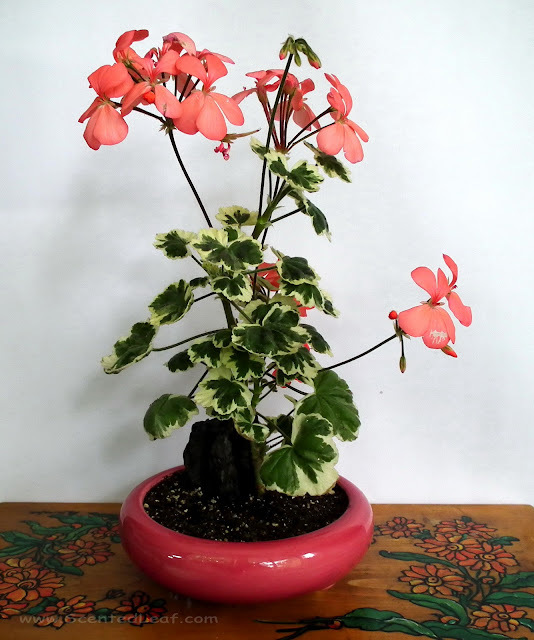 Pelargonium zonale " Moulin Rouge"
I 've liked since always the myrrh scent, so we decided last year to enlarge the collection of flavors from our scented garden with Pelargonium myrrhifolium var myrrhifolium. 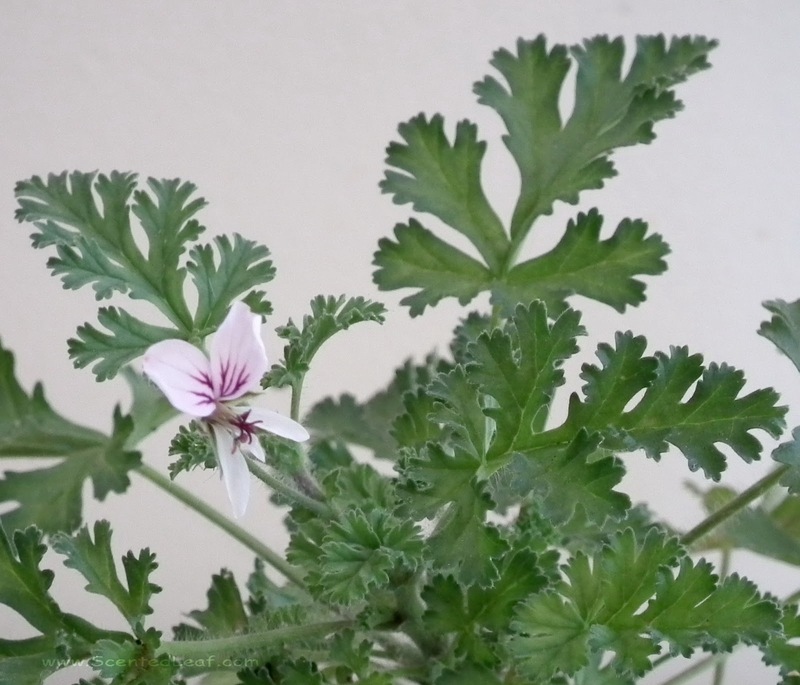 Pelargonium myrrhifolium var myrrhifolium is a shrubby pelargonium with finely divided leaves, not so sticky and covered by glandular hairs, which are releasing a scent like fresh myrrh if rubbed. 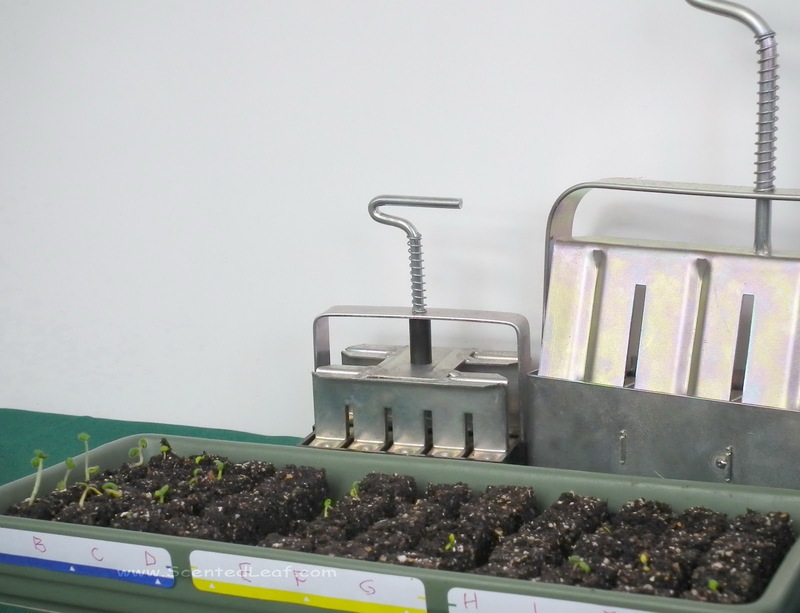 The plants were started from seeds ordered from South Africa in small soil blocks formed with special molds (together with some balsam scented varieties), latter on being moved into larger soil blocks, and after 4 months, into their pots. 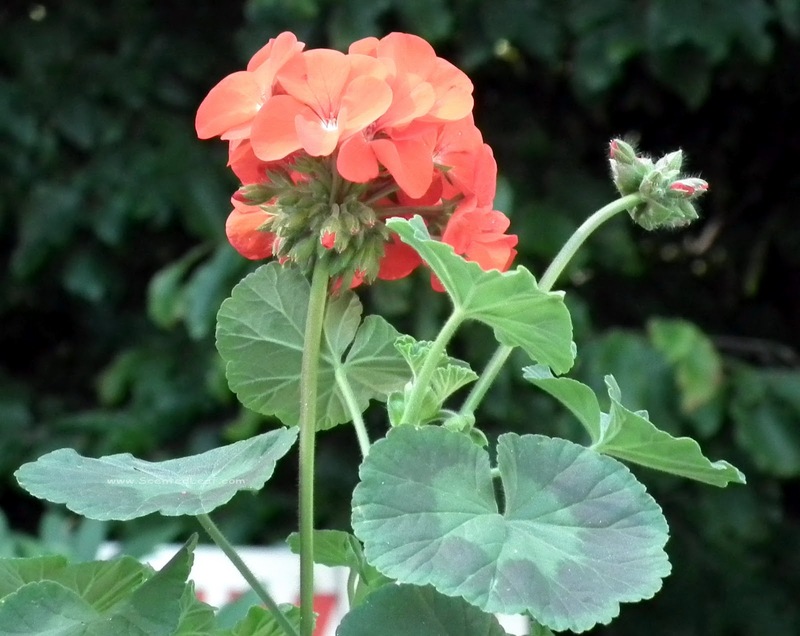 The plants grow quite slowly, but started to bloom within one year from seed germination. 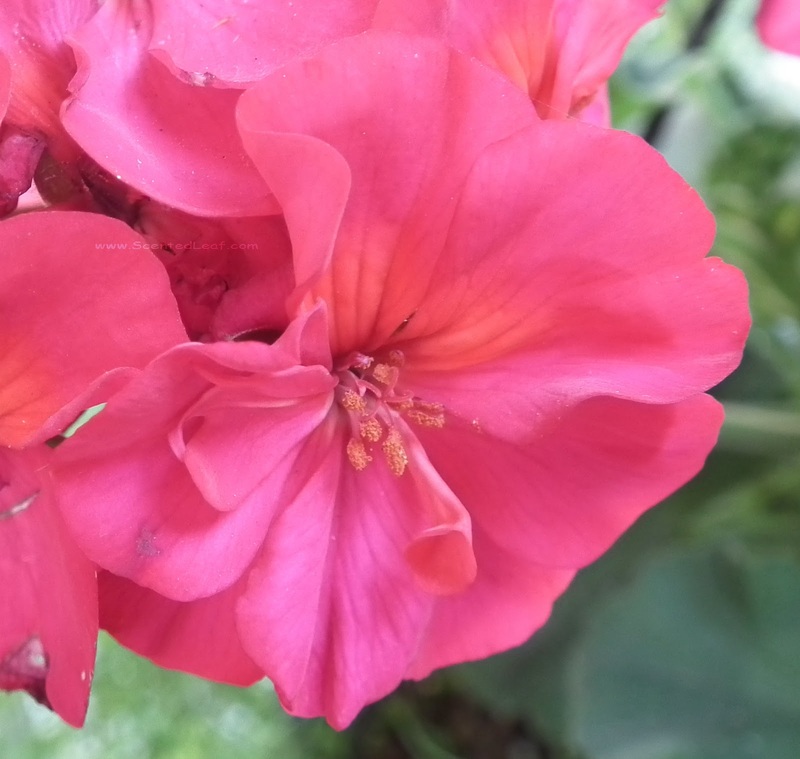 The flower is quite large, very attractive with a pale lilac color and dark purple markins (I'm still waiting to see if any of plants will make white ones). I cross my fingers to be followed by the distinctive cranesbill seed heads to gather also their seeds. 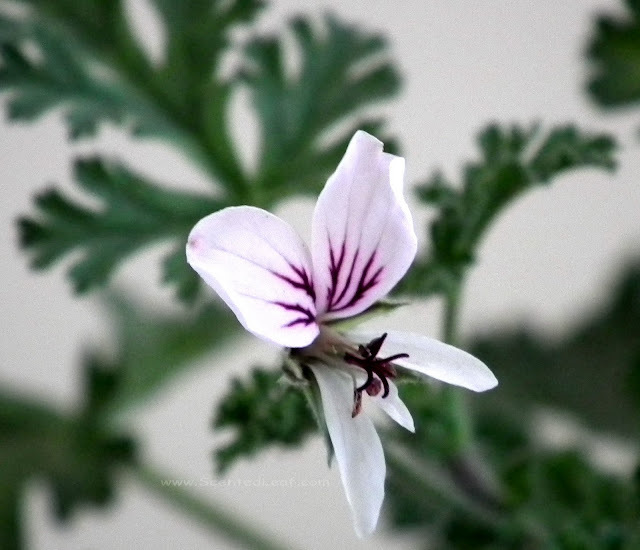 Pelargonium myrrhifolium var myrrhifolium is a drought tolerant plant that require a sandy well drained soil. 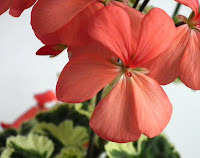 It is said that it is hardy to frost pelargonium which will bloom till January, thus we will overwinter them outside, with some protection against winds and rain (last winter we kept them indoor, like all seedlings, under artificial light). 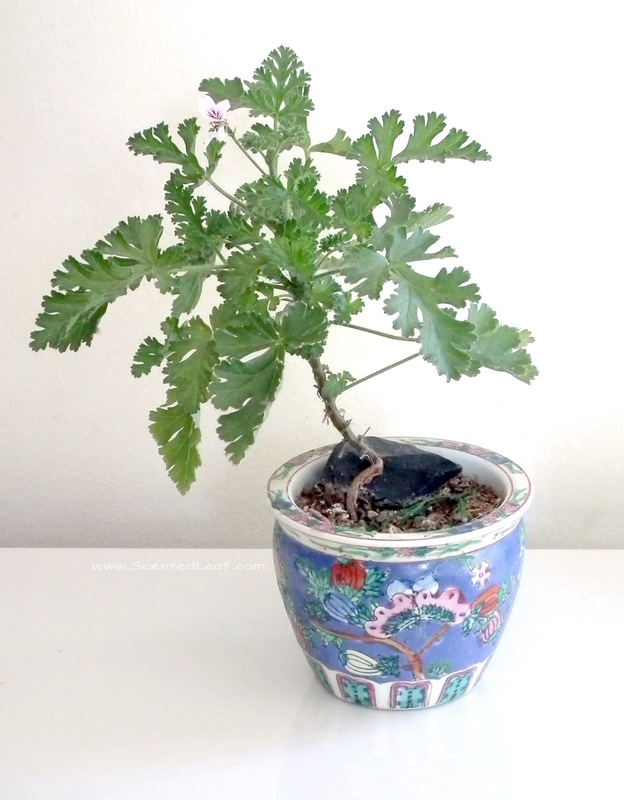 Initial the stem looked green and herbaceous, but it became woody, and somehow brownish with the age - and as we estimated, could be wired easily and make interesting pelargonium bonsai.